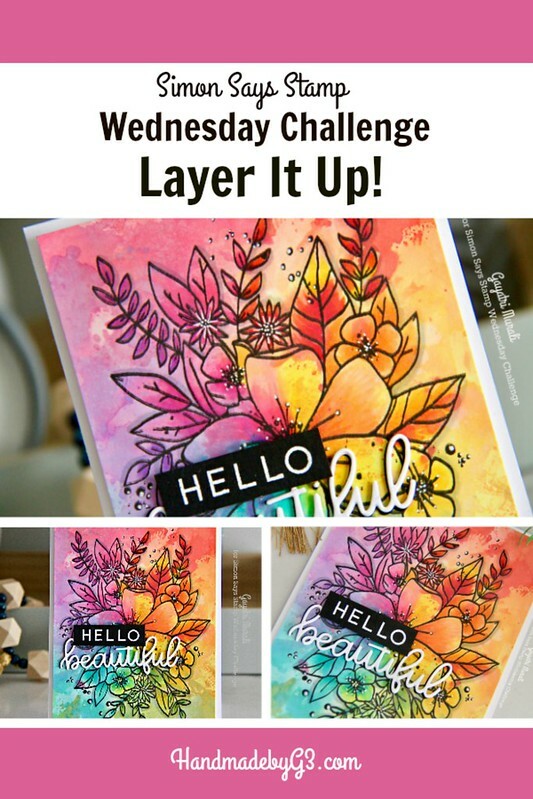 Simon Says Layer It up! Thank you for joining us for the Add A sentiment Challenge and we hope you will all join us again this week too. We are showcasing Concord &9th Products this week. You don’t have to use them to join in but if you have them we would love to see them used. Layers mean so many things. It can be adding layers of pattern paper or cardstocks or die cuts or even colouring mediums. I decided to layer up inks and copic marker colours on my card for the challenge. 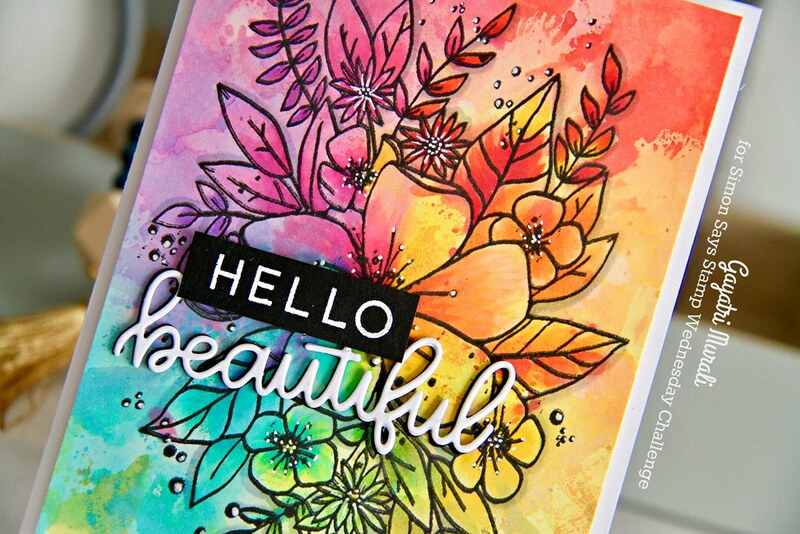 The inspiration for this challenge comes from the super talented and one of my favourite card designers Kelly Latevola. Her videos are such an inspiration for me that I look forward to them each day. I have learned so much about colouring with copic markers from her and she explains it so well I tell you. I love her stories too. When I want a glass of water to drink, I ask for “clean clear water” like how Kelly says in her videos. I no longer say just water. 🙂 So thank you so much Kelly for sharing your talent and your video tutorials. Love ya so much. I tried to recreate this beautiful and colourful card by Kelly and I am so thrilled by how well it turned out. Card base is Neenah Solar White cardstock. I used Arches hot press watercolour paper and smooshed Distress Oxide Inks in rainbow colours. The colours I used are Peacock Feather, Twisted Citron, Wilted Violet, Wild Honey, Spiced Marmalade, Candied Apple, Picked Raspberry and Peeled Paint. I started with a light even layer of each colour. Dried each colour before adding the next. Then I added another darker layer of the same colour with lots of spatters and hard edges. Again dried each colour before adding the next. I let colours next to each other blend a bit. Then I added spatters of clean clear water and dabbed the excess off. Dried the panel using heat gun. Using MISTI, I stamped the image from Hello Lovely stamp set from Concord and 9th using Simon’s Intense Black Ink. I left the stamp in the MISTI. I then used copic markers slightly darker shades of each colour to add shading to the stamped image. I also used cool gray markers to add shadow to the image. Then I put the panel back into MISTI and stamped the image again over the previously stamped image to get darker outline. Using Sakura white gel pen, I added details to the image. 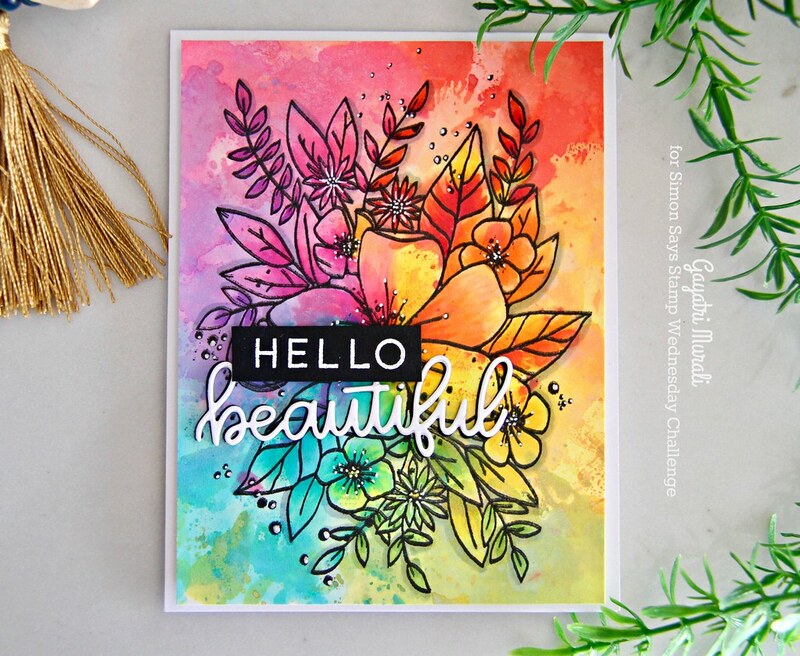 The die cut sentiment is from Simon’s Hello Beautiful Gorgeous die set. I die cut two beautiful in white cardstock and one in black cardstock, stacked glued the whites and offset the black die cut a little and glued to give shadow. The smaller sentiment from Hello Lovely stamp set is white heat embossed on black cardstock, trimmed and adhered using foam adhesive. I absolutely love the layers of inks and shading using the copic markers. Such a brilliant way of using colours. I love bright colours and this makes me so so happy. Hope you like this card as much as I do. Another card for Kathy Raccosin from The Daily Marker‘s 30 day Colouring Challenge. If you like to bookmark my card, then here is the pin image. Thanks for stopping by and I cannot wait to see what you do for the challenge. WOW, in your face beautiful! 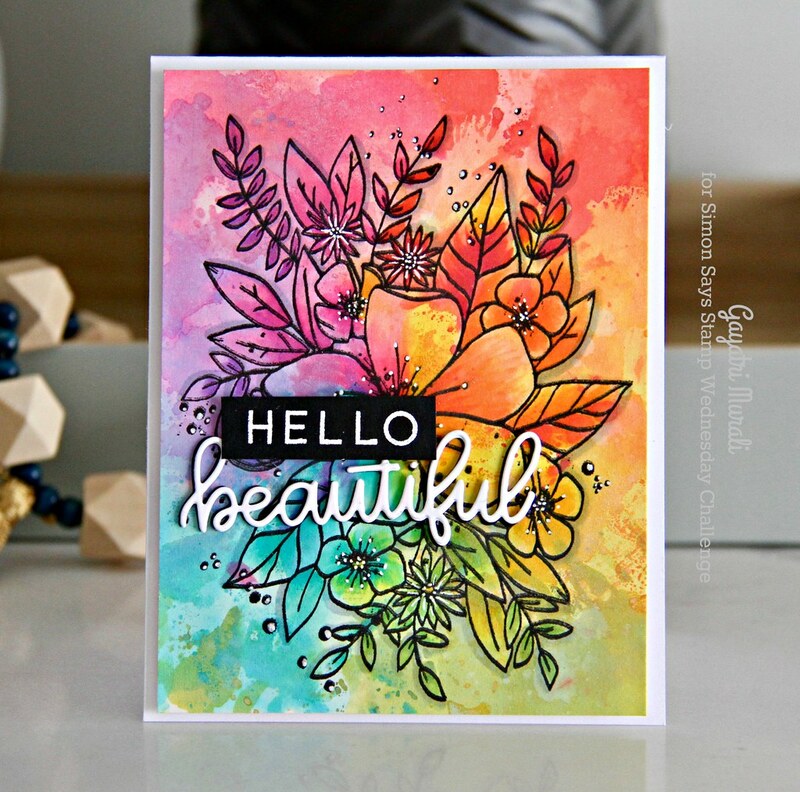 What a gorgeous blend of colors, Gayatri! What a fantastic card! 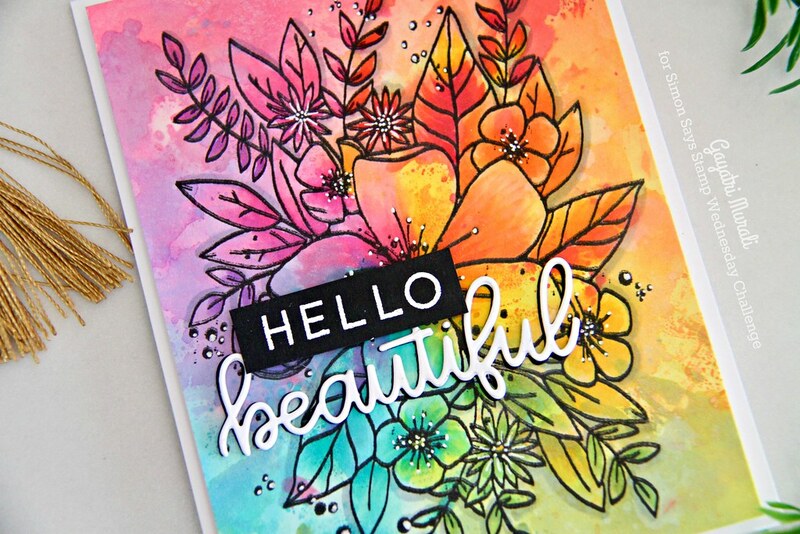 Love the black and white on this colorful card……..so pretty! Absolutely gorgeous, Gayatri. I LOVE this card. Gorgeous card. Love all the colors. Thanks for sharing. I love Kelly! I do not have any Copics but plan to soon! I love this card! I am a new fan and have started looking for your cards. Do you have videos or a YouTube channel? Absolutely stunning! I can’t tell where the Copic coloring is–just looks amazing!